Founded in 1850, Emile Henry® has established a worldwide reputation for manufacturing the finest quality ceramic ovenware, gourmet cooking products, and bakeware products. Emile Henry® offers a wide array of products and shapes that are properly designed for cooking and baking. The products have the dimensions, depth and special features that discerning gourmands desire. Located in Marcigny, a small town in the province of Burgundy, France, Emile Henry® manufactures all of their new cooking products from Burgundy clay using their state-of-the-art Ceradon® manufacturing process. Burgundy clay diffuses cooking heat to the very center of the cooking dish and allows food to be cooked evenly and flavors and aromas to be brought out. The Burgundy clay used in Emile Henry® products also has superior heat retention properties which keep food hot and more flavorsome. All Emile Henry® products exhibit extraordinary thermal shock properties. They can go directly from the freezer to the oven or the broiler to the microwave. Emile Henry® products do not chip or crack easily. One can cut directly on the surface without scratching or damaging the product. All Emile Henry® products are dishwasher safe, making clean up extremely easy. There is no lead or cadmium in Emile Henry® products, all of the glazes meet California Prop 65, and all of the products are 100% food safe. Offered in a large variety of colors, the glazes will not craze, discolor or fade over time. Start making your own gourmet masterpieces with Emile Henry® today! 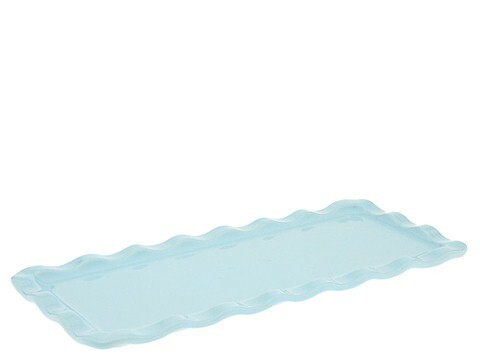 Make a scrumptious cobbler in the '9 X 9 Inch Square Baking Dish' from Emile Henry. All Emile Henry cookware is made of mineral-rich Burgundy clay. Beautiful, natural-looking ceramic cookware heats evenly and maintains temperature for long periods of time. Smooth glaze coating in rich color is extremely strong, resists sticking, and is easy to clean. Exclusive manufacturing process makes this cookware chip, crack and scratch resistant. Suitable for the freezer, refrigerator, microwave and conventional ovens. Can be used under the broiler. Depth; 2, weight; 2.8 lbs. Dishwasher safe. Made in France. Emile Henry - 15 Inch Rectangular Platter (Sky) - Home The '15 Inch Rectangular Platter' is perfect for serving appetizers or a bread loaf. Beautiful, natural-looking ceramic cookware heats evenly and maintains temperature for long periods of time. Smooth glaze coating in rich color is extremely strong, resists sticking, and is easy to clean. Exclusive manufacturing process makes this cookware chip, crack and scratch resistant. Suitable for the freezer, refrigerator, microwave and conventional ovens. Can be used under the broiler. Dimensions; 15 x 6, weight; 2 lbs. Dishwasher safe. Made in France. 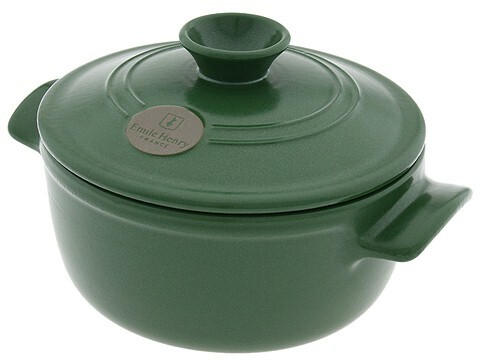 The '1.9 Quart Flame Round Stew Pot' from Emile Henry is ideal for cooking rice or lentils. Beautiful, natural-looking ceramic cookware heats evenly and maintains temperature for long periods of time. Smooth glaze coating in rich color is extremely strong, resists sticking, and is easy to clean. Self-basting bumps on the inside of the snug fitting lid redistribute juices for better flavor. Works great on gas flame, electric and halogen cooktops (except induction). Suitable for the freezer, refrigerator, microwave and conventional ovens. Can be used under the broiler. Diameter; 7, weight; 2.5 lbs. Dishwasher safe. Made in France. Emile Henry - 11 x 14.5 Inch Lasagna Dish (Citron) - Home Not just for lasagna, use this beautiful Emile Henry dish to roast vegetables too! ; Natural-looking ceramic cookware heats evenly and maintains temperature for long periods of time. Smooth glaze coating in rich color is extremely strong, resists sticking, and is easy to clean. Exclusive manufacturing process makes this cookware chip, crack and scratch resistant. Suitable for the freezer, refrigerator, microwave and conventional ovens. Can be used under the broiler. Weight; 6.6 lbs. Dishwasher safe. Made in France. 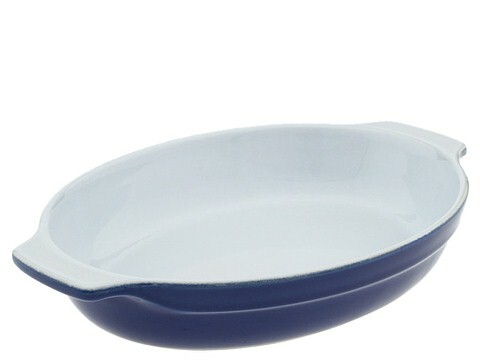 Get oven-to-tabletop serving convenience with the 2 Quart Oval Gratin Dish . Beautiful, natural-looking ceramic cookware heats evenly and maintains temperature for long periods of time. Smooth glaze coating in rich color is extremely strong, resists sticking, and is easy to clean. Exclusive manufacturing process makes this cookware chip, crack and scratch resistant. Suitable for the freezer, refrigerator, microwave and conventional ovens. Can be used under the broiler. Depth; 2, weight; 2.75 lbs. Dishwasher safe. Made in France. 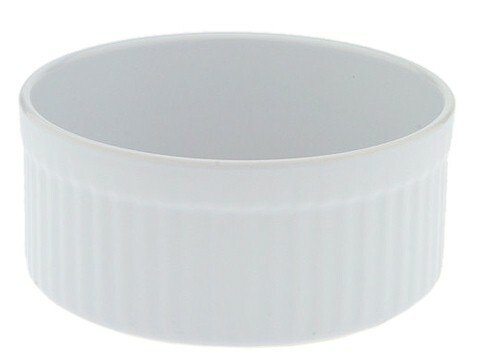 Emile Henry - 2 Quart Souffle Dish (Blanc) - Home The high sides and even-heating of this Emile Henry earthenware dish allows the souffle to rise properly. Beautiful, natural-looking ceramic cookware heats evenly and maintains temperature for long periods of time. Smooth glaze coating in rich color is extremely strong, resists sticking, and is easy to clean. Exclusive manufacturing process makes this cookware chip, crack and scratch resistant. Suitable for the freezer, refrigerator, microwave and conventional ovens. Can be used under the broiler. Diameter; 10, depth; 3.5. Weight; 2.6 lbs. Dishwasher safe. Made in France. Create melt-in-your-mouth pies with the superior heating properties of earthenware. All Emile Henry cookware is made of mineral-rich Burgundy clay. Beautiful, natural-looking ceramic cookware heats evenly and maintains temperature for long periods of time. Smooth glaze coating in rich color is extremely strong, resists sticking, and is easy to clean. Exclusive manufacturing process makes this cookware chip, crack and scratch resistant. Suitable for the freezer, refrigerator, microwave and conventional ovens. Can be used under the broiler. Depth; 1.5, weight; 2 lbs. Dishwasher safe. Made in France. 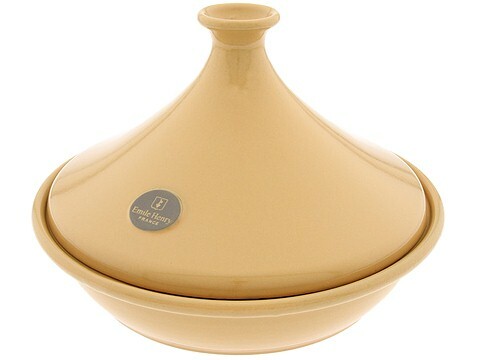 Use your imagination and the 'Flame Top 2.6 Quart Tagine' from Emile Henry to create your own tagine dish. A tajine is a North African dish, typically a slow cooked stew, named for the special type of pot it s cooked in. The flat base has a cone-shaped cover that returns moisture back to the food. 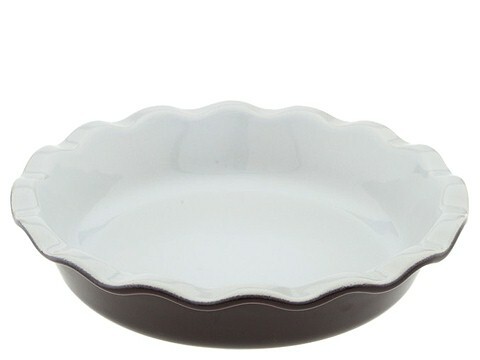 With the cover removed, the base can be used as a serving dish. Beautiful, natural-looking ceramic cookware heats evenly and maintains temperature for long periods of time. Smooth glaze coating in rich color is extremely strong, resists sticking, and is easy to clean. Snug fitting lid seals in flavor and moisture. Works great on gas flame, electric and halogen cooktops (except induction). Suitable for the freezer, refrigerator, microwave and conventional ovens. Can be used under the broiler. Diameter; 12.4, weight; 4.1 lbs. Dishwasher safe. Made in France. Easy recipes make cooking easy!